But of the 317 players that have reached that milestone, none were more important to the individual than the night Dustin Brown laced them up in a Los Angeles Kings sweater. Given the physical demands of the sport and the fact that every fall there are younger, faster and – even more important these days – cheaper talent attempting to wrest a position away from a veteran, 1,000 is a massive achievement. When you factor in the time, energy and dollars spent just to get to NHL Game 1, the accomplishment is the sport’s version of a lifetime achievement award. After a couple of miserable seasons at the end of the Dean Lombardi-Darryl Sutter era, Brown’s game has risen like a Phoenix on the corner of 11th and Figueroa in downtown Los Angeles. With a management team that believes he has plenty more effective nights to offer, Brown has flourished alongside Anze Kopitar to put up numbers that he taken him out of the “worst contract in the NHL” discussions. The cherry on top of the 1,000 sundae occurred last week when he potted the game-winning, overtime goal against the Colorado Avalanche in his milestone game, a fitting play to start off a week of honors that culminated in not surprisingly, a pre-game honor Thursday night and very surprisingly, a first-person account of his life and times in Los Angeles published by The Players Tribune. I’ve been fortunate to cover this great game over the past two decades and it’s humbling to be around greatness. I’ve chatted with Hall of Famers and fourth line grinders, but as it concerns Dustin Brown, well, this one is personal. If you’ve followed my travels over the past five Kings seasons, it’s not hard to connect the dots to see that there is a bond between writer and player. For most of his career, I was probably just another media “pigeon” being pesky around his stall at practices and post-game looking for some crumbs in the form of quotes. I’m one of those who has hung around long enough to see the entirety of his career, and after he shook off the struggles of his rookie season, admired his skill and physicality – evaporating assets in today’s NHL. My interactions were cordial and brief and were not anymore special than chatting with Kopitar or Drew Doughty. And then Darryl Sutter came to town. Brown documented the tough times in 2012 via The Players Tribune piece, so there is no need to repeat them here, but around the time that Tim Leiweke strode into the Kings locker room and made his definitive pronouncement, I was contacted by Dustin’s wife Nicole for my thoughts on the prospects of Dustin being traded out of Los Angeles. We’ll keep the details of our conversation private, but communication grew and the relationship bloomed. Nicole was a regular guest on our Sirius XM radio show throughout the championship season and I was welcomed into their home – usually delivering banana bread whipped up by my far-better half. Even in the golden years from 2012 to 2014, the relationship between Brown and Sutter was always tenuous, and to this day, there lacks a valid explanation as to why. Things worsened in the 2014-15 season. Despite having two Stanley Cup victories, Sutter never let off the accelerator and was supported by Lombardi. If you think coaching doesn’t matter in professional sports, you’re dead wrong. Brown’s play plummeted in direct proportion to the constant negative feedback he heard at practice and on the bench during games. As his lack of productivity extended over multiple seasons, his critics not only cited a salary cap hit that was for too high given his lack of production, but now questioned if he was done, that playing his style over a decade had eroded his skills. When Sutter was re-upped after the 2015-16 season, Brown would have welcomed a trade away from the only franchise he has suited up for, but scouts saw what we all saw: an ineffective, high-priced player who, on some nights, was banished to the fourth line in favor of Dwight King. The final weeks of the 2016-17 season were rock bottom – not only for Brown, but for the entire team. The team had tuned out Sutter and their play showed it, falling to 10th place in the Western Conference. 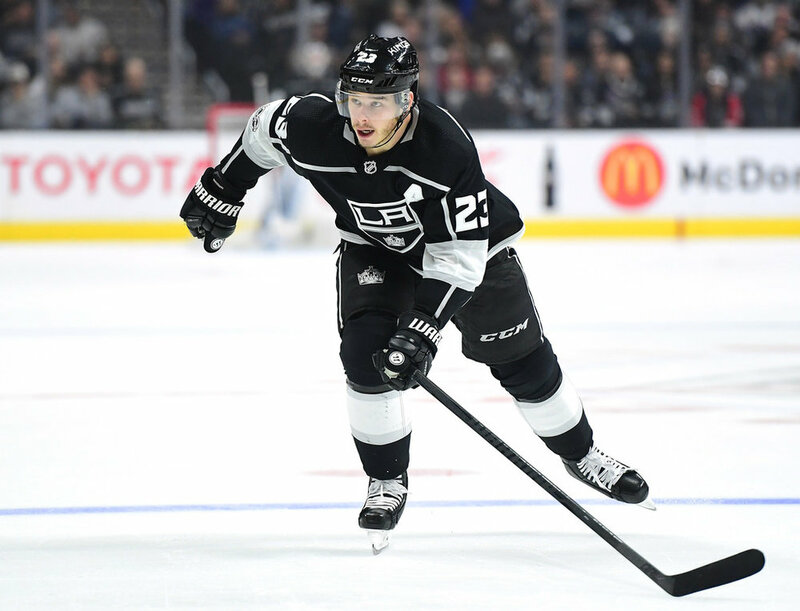 There were no takers at the trade deadline (again) and the conversations I had with Brown were primarily about being on the Kings’ protection list and the odds of him being selected by Vegas GM George McPhee in the June expansion draft. The reality was that Dustin Brown was just done with Darryl Sutter not done being an effective player. The days of the taskmaster in professional sports, not just the NHL, are in their final days. I will point you to John Stevens and Gerard Gallant as two examples of the type of personality it now takes to get through to players as we enter 2018. From this seat, there was zero surprise to see Brown’s game climb due north with Stevens, a man who respected Brown as both a player and a man now encouraging him at every turn. 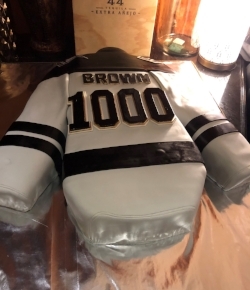 One year ago, I would have made a big bet that Brown would have not celebrated his 1,000th game in a Kings uniform. With Sutter just one-year into a multi-year and Lombardi appearing to be firmly in control of the franchise, I think Brown would have made the same bet. Despite all the professional achievements, there were few nights as important to Dustin Brown as Night 1,000 and to be there to witness publicly and privately (the Browns were kind enough to invite me to their post-game gathering – nice cake, eh?) was truly an honor. During a text conversation with an NHL player earlier this month, he made a point about an upcoming milestone. “The season really starts January 1,” he said. So bad, good or indifferent, the results of the first 30 games will be erased or amplified in the final 50 game sojourn to mid-April. Over the next eight weeks, a handful of high-profile players are sure to change destinations and towards that end, we’ll have some takes on how, why and where they may land. WHY: If you’ve watched more than one Sabres game this season, you know the roster is dotted with high priced, underachieving veteran-talent that has failed to grasp either Phil Housley’s message or system. A team that was thought to be on the cusp of a playoff position has staggered to the basement of the Eastern Conference. Fortunately, for Evander Kane, his strong play will having him exiting Buffalo before the end of a brutal western New York winter. He leads the Sabres in goals (15) and is a shorthanded threat as well (3 shorties) and is clearly the best power forward/left wing on the market. Questions about his attitude always surface when trade rumors abound, but in watching this player over the course of the last two seasons, I’ve seen nothing but maximum effort by an impact player for an underachieving franchise. HOW: I can’t fathom Vegas GM George McPhee moving James Neal given the Golden Knights incredible start, so Kane is clearly the top left winger on the trade board. In what appears to be a strong seller’s market, Buffalo GM Jason Botterill should do no worse than a first round pick, a prospect and some form of third asset for Kane. With few impact goal-scorers in play, the return on Kane is vital for a successful reboot in Buffalo. Sharks – When you lineup Jannik Hansen, who is goalless in his last 30 games (but he does have 3 assists) alongside Joe Thornton and Joe Pavelski some nights, it’s pretty telling the Sharks have a hole on the left side. San Jose has stayed in the Pacific Division race by playing a patient, low-risk game that is a difficult watch most nights. Despite getting to the Stanley Cup Final two seasons ago, GM Doug Wilson continuing inability to find depth scoring can be rectified to a large extent by being the highest bidder for Kane. Bruins – The sneakiest of all Eastern Conference contenders, Boston has fashioned a strong run on the backs of arguably the second best line in hockey – Brad Marchand, Patrice Bergeron and David Pastrnak. While their depth is decent along the left side with solid performances from Danton Heinen and Jake DeBrusk, neither are the proven quantity that Kane is. Even with David Backes increased scoring of late, Kane is an immediate upgrade for their second line and powerplay unit. With the second seed in the Atlantic behind Tampa Bay up for grabs, a Kane play would enhance the B’s odds for a first-round post season home ice advantage. Blues – St. Louis probably wouldn’t be in the mix but for Jaden Schwartz’s ankle injury, but even if he was healthy, the Blues are similar to the Bruins as their offense is primarily derived from their top line – Vladimir Tarasenko, Brayden Schenn and your choice of fill-in left wingers. The Blues depth forwards/bottom six are as solid as any, but Kane appears to be a great fit as St. Louis marks time waiting for Schwartz and is an upgrade on their second line upon his return. The biggest challenge to landing him is the lack of a 2018 first round pick that was moved for Schenn – imagine where they would be without him. Rangers – Four words place the Blueshirts squarely in the mix: Chris Krieder Out Indefinitely. 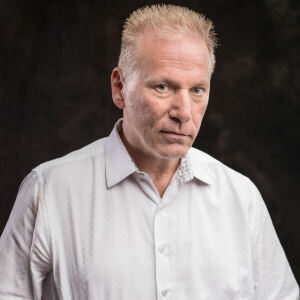 Players returning from blood clots usually take 6-8 weeks to get action, which would target Krieder’s return just days before the trade deadline. Jimmy Vesey will get a shot at Krieder’s spot and his play over the next month will go a long way in determining if they are a serious player for Kane. Flames – You would think Calgary would be set with Johnny Gaudreau and Matthew Tkachuk as their top six LWs, but with Gaudreau in the midst of a cold streak and Tkachuk is looking like a mid-teens goal-scorer; Kane could be the boost this underachieving group needs. Golden Knights – Three months ago, this suggestion would have been a joke but based on the Knights play and Kane’s previous notorious social media posts alone, but I’d bet he’d welcome a deal to the desert. Although Vegas is among the top offensive squads in the League, the question of their staying power (is William Karlsson a 30+ goal scorer) as the season lengthens makes Kane an attractive addition. The Golden Knights breezed through Southern California this week and put on display the brand of hockey that has vaulted them to the top of the Pacific Division. Playing with intensity from the opening faceoff to the final horn and getting contributions from throughout the lineup, they swept the Ducks and Kings to extend their record against the Pacific Division to 11-1-0 and 18-4 against the Western Conference. In both victories, they rallied after surrendering the first goal, but won in different fashions. They controlled the Ducks throughout while cruising to a 4-1 win and engaged in a thrilling third period and overtime to beat the Kings on 3-2 in overtime. Vegas is the best story of the early NHL season, and arguably one of the best sports stories of 2017. Las Vegas has embraced this team when many questioned (both outside and inside the city) the viability of a professional sports franchise in the 702. The organization is very media friendly – at the end of Gallant’s availability in Anaheim, their PR rep asked for more questions, an occurrence that is about as frequent as sighting Haley’s Comet. So with a feel-good story in full effect and notions of playoffs dancing in their heads, a Golden Knights-Kings postseason series would help develop a natural rivalry given the proximity and the willingness for fan bases to travel between cities (yes, folks, Vegas does have fans who travel). Though Vegas has won both matchups this season, one player who is less impressed than the rest of us is Drew Doughty. Never shying away from an opportunity to talk, Doughty is doing his best to make the back-to-back, home-and-home series in February even more intriguing. This one didn’t stay in Vegas, did it? Oct. 30, 2017 - "Hockey is Fun Again"